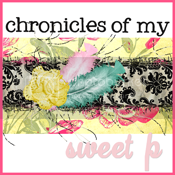 Growing and Gleaning: Martha Does Hanukkah! This last weekend I hosted a table at my churches annual Ladies Dessert Night. Seeing as how we have no extra money right now and my china is blue, I went with what I had and made a Hanukkah themed table! 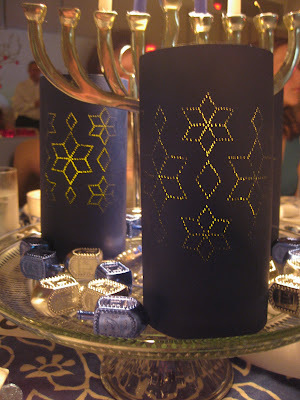 Well, my good neighbor (and creative mastermind behind most things crafty that I do) gets Martha Stewart Living and she knew I was doing a Hanukkah table and showed me just what Miss Martha had going on her Hanukkah table! 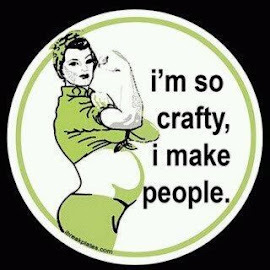 Thus with the help of Crystal-Lee and my mom, two projects were born out of the cuteness found in the December 2009 issue of Martha Stewart Living! These were so easy and cute! 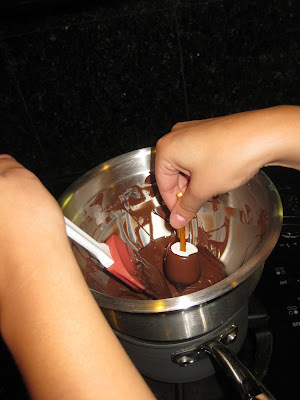 Melt some chocolate, dip the bottom of the kiss in the melted chocolate and stick it to the marshmallow. Wait about 2 min for that to harden and then stick a pretzel stick in the other end. 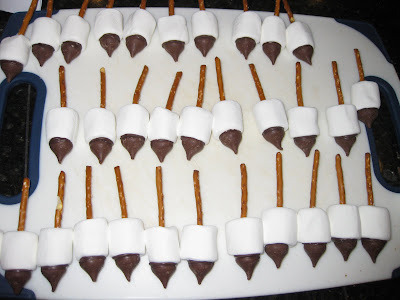 After that you can start dipping the little beauties into the melted chocolate and laying them on wax paper to harden. 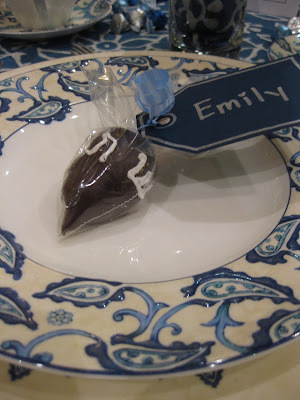 Then you make some frosting that will get hard (we used royal icing) put it in a piping bag, put the symbols on and you have the cutest little dreidel / place card that there ever was! What's your #? How do I get a hold of you? I love the candles. 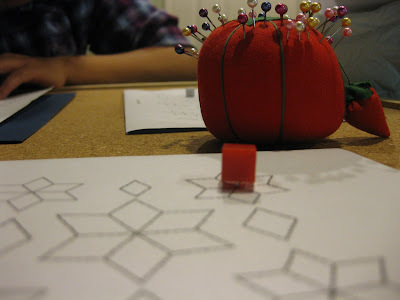 I do a project similar to that in my second grade classroom and call it "Push Pin Art." I copy the design on regular white paper and then tape it to construction paper. The students get a push pin (much easier on the fingers) and they lay the paper on the floor and start punching! They take the designs home and hang them in their windows for decorations (I have lots of different holiday themed pictures).